Warmer climates will adore the Marian Sampson Monardella or Coyote Mint. This tiny plant is big on excitement. The late spring blooms are huge in comparison to the plant itself. Massive tubular clustered red flowers tower over the tiny dark, shiny green leaves of the Marian Sampson perennial. Plant in dry areas of your yard or garden - a choice drought resistant and waterwise plant. 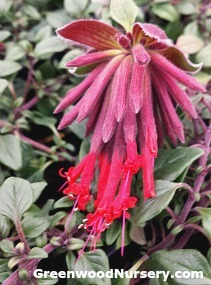 This monardella is best used as in containers or in rock gardens. May only last a few seasons, the Marian Sampson Monardella can be an annual hummingbird attracting plant in cooler regions. Also referred to as Coyote Mint and Scarlet Monardella. Marian Sampson Monardella ships in 3.5 inch pots. Orders shipping to CA and AZ will be bare rooted before being prepped for shipping.